The Sculpture Museum Glaskasten Marl includes sculpture, video and sound art, which are also reflected in the exhibition. Two plants are to be newly produced for the exhibition with a special focus on the situation of the coal mining site Marl and the Ruhr area. Denise Ritter will record noises underground and use them to create an electroacoustic sound installation. Another site-specific video work will also address the specific conditions and phenomena of coal mining. 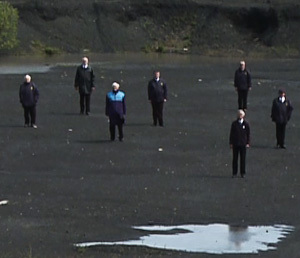 Jeremy Deller’s video work The Battle of Orgrave is a reflected re-enactment of the heated situation at the end of coal mining in England in the late 1980s. This emotionally highly charged work reflects the economic and social contradictions of Margret Thatcher’s politics, which show a clear contrast in comparison with the development in Germany. Steve McQueen has created a video that also causes a strong physical presence in the viewer: The mining journey of black African miners in 3. 000m depth is set in its tormenting physical urgency in the picture. Coleen Alborough has created a relief-like installation that conveys an imaginative picture of South African coal mining in small scale, which also allows a comparison to the situation of the now-ending coal mining in Germany. This work is supplemented with an abstract black and white video. The more or less conventional, metal worker sculptures from the collection of Werner Bibl form the plastic counterpart and frame to the virtual media. which also allows a comparison to the situation of the now-ending coal mining in Germany. This work is supplemented with an abstract black and white video. The more or less conventional, metal worker sculptures from the collection of Werner Bibl form the plastic counterpart and frame to the virtual media. which also allows a comparison to the situation of the now-ending coal mining in Germany. This work is supplemented with an abstract black and white video. The more or less conventional, metal worker sculptures from the collection of Werner Bibl form the plastic counterpart and frame to the virtual media.